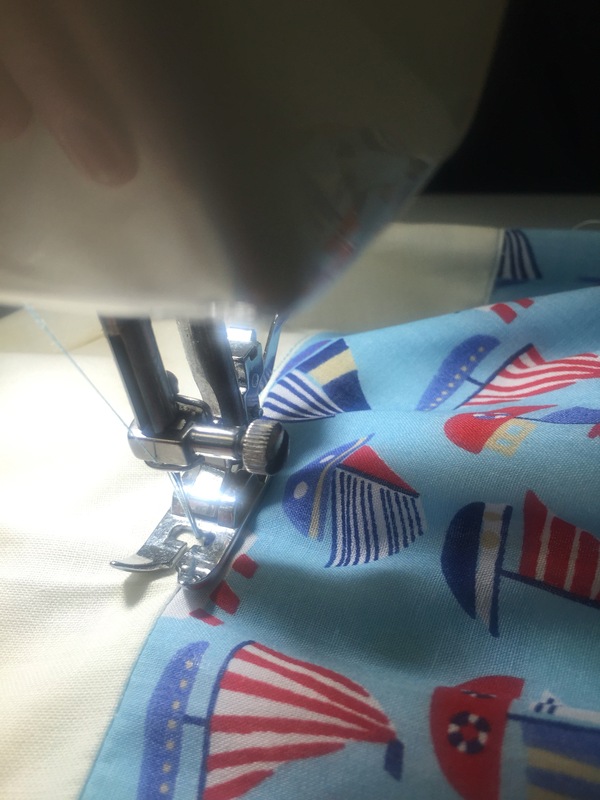 Sunday Sevens is a weekly blog series created by Natalie at the Threads & Bobbins blog. It features seven photos from the past seven days. If you would like to join in, pop over to her blog to find out more. You may remember that in last week’s Sunday Sevens I had a rather dramatic photo of the waves crashing onto the rocks at Europa Point. 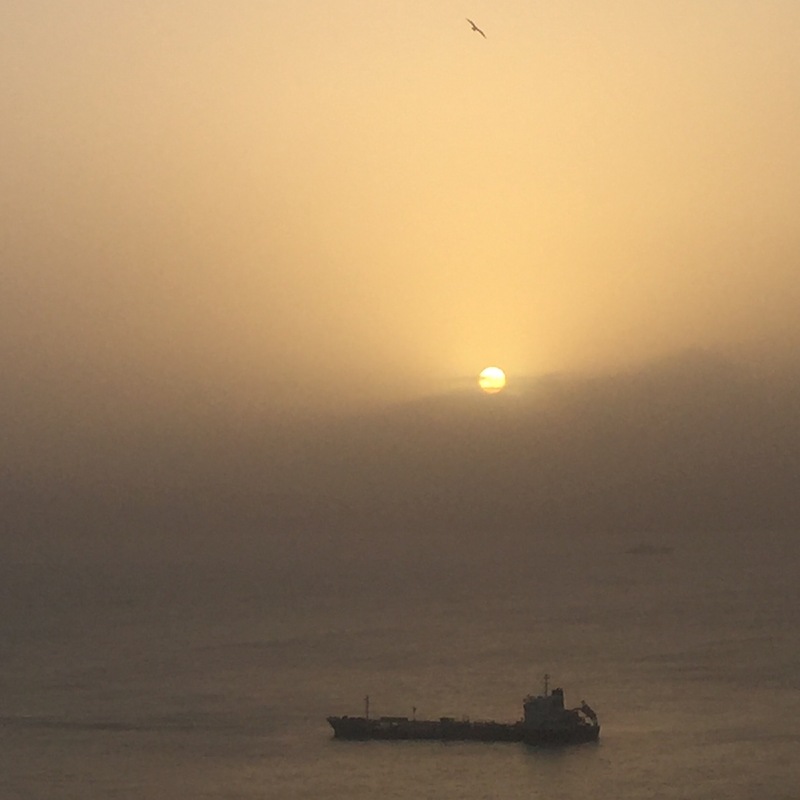 Well, that stormy weather whipped up a lot of Saharan dust and on Sunday we were treated to a rather murky and strangely atmospheric day. We decided to go to the cinema in the afternoon and walked across the grass at Commonwealth Park on our way home. All our shoes were coated in orange dust by the time we got to the car. The car was pretty orange too – so glad I washed it at the end of last week! In my dressmaking class I cut out the fabric for my full circle skirt. I love it so much – it has flowers embroidered on it in coordinating thread which you can’t see in the above picture. I have done my back seam and inserted my zip already. Just need to finish the waistband and hem and it’s sorted. I had a lot more success in this class than with my curtains! We are lucky enough to be able to grow lemons on our back patio. Last year with our homegrown ones and a few gifted to us by friends & neighbours I ended up with a bit of a glut so made some lemon curd. I had never tasted it before that first time making it – it was delicious. So, as I found myself with rather a lot of lemons in the fruit bowl this week I thought I’d have another go. This photo doesn’t do it justice, believe me when I say it’s glorious. Due to poorly children and wild weather conditions I haven’t made it up the Med Steps for a whole month. This week, though, accompanied by two crazy friends, we restarted our training for the Med Steps Challenge (which involves climbing them 5 times in the one day – yes I know, utter madness). Anyway, we set off and it was rather hard work after 4 weeks without training. It was a foregone conclusion that we would do it twice and at the end of the second circuit we were feeling pretty energized so decided to have a go at a third trip up – BIG MISTAKE. Cor blimey it was tough. If I hadn’t have been with my training buddies I truly would have laid down part way up and finished it on my hands and knees. It was utterly exhausting. I got home and only had the energy to kick off my shoes before flopping on the bed and falling asleep for over an hour!! I’ve been feeling like a very old woman ever since. Any pleasure at having completed the 3 circuits in 2 hours 50 minutes has been overshadowed with the terror of wondering how awful number 4 & number 5 will be… Anyway the above photos were taken one on each trip up the steps. I took loads of photos on the third trip just for an excuse to stop!! This week at my watercolour class I was planning to begin my next architectural painting. However, when I arrived for my lesson, my teacher had a beautiful vase of daffodils in the middle of the table and I decided to put the ‘window’ picture off until next week and have a stab at the daffs. I’ve had some successes with painting flowers so I somewhat arrogantly thought ‘how hard can this be?’. How wrong I was – they are flipping hard in spite of their relatively simple shape. Perhaps their apparent simplicity is the hard part as they can very easily look out of proportion. They are gorgeous ‘spring-y’ colours though :-). 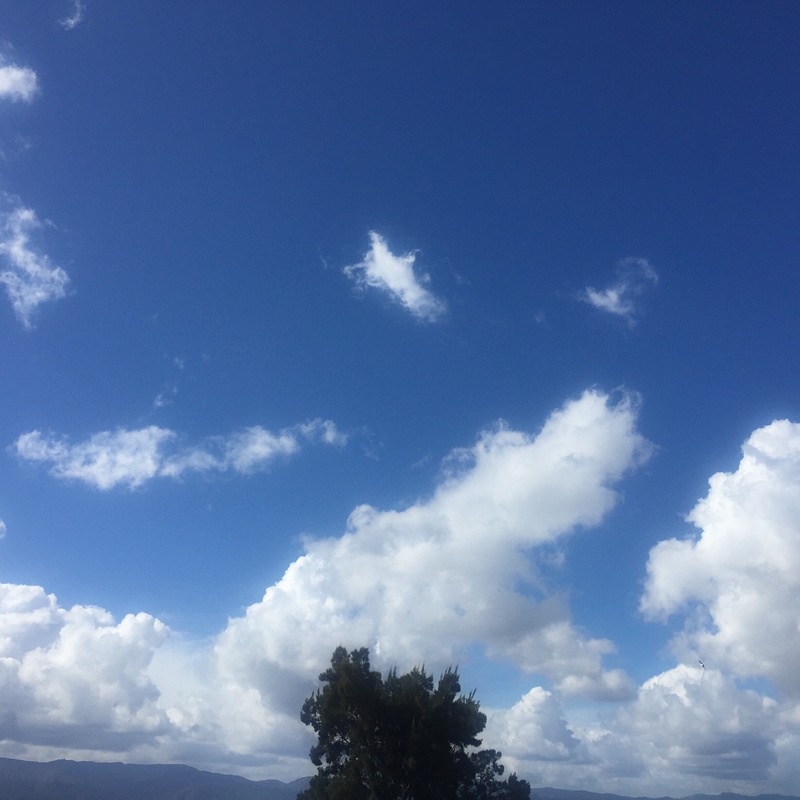 Yesterday we enjoyed beautiful skies after the morning’s showers had cleared away. I think fluffy clouds like this against the blue are so beautiful. 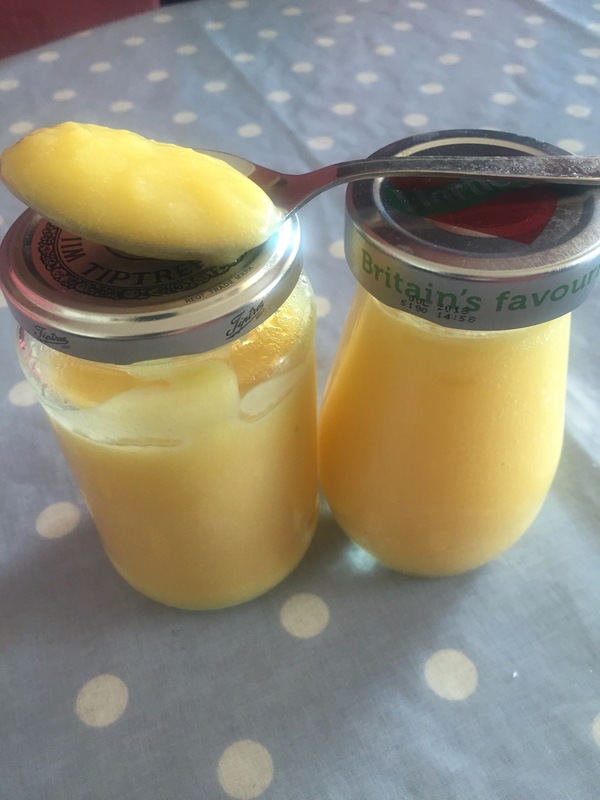 We don’t grow our own lemons but we do ‘grow’ our own eggs so I always have some home made lemon curd on the go. I love it on porridge especially. I’m really looking forward to seeing your finished circle skirt. 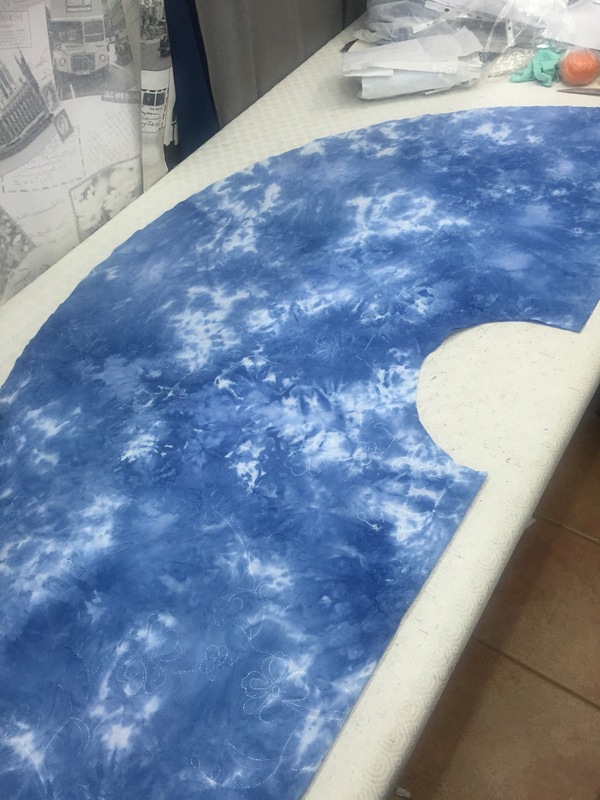 It must take tons of fabric – Is it cut on the bias? 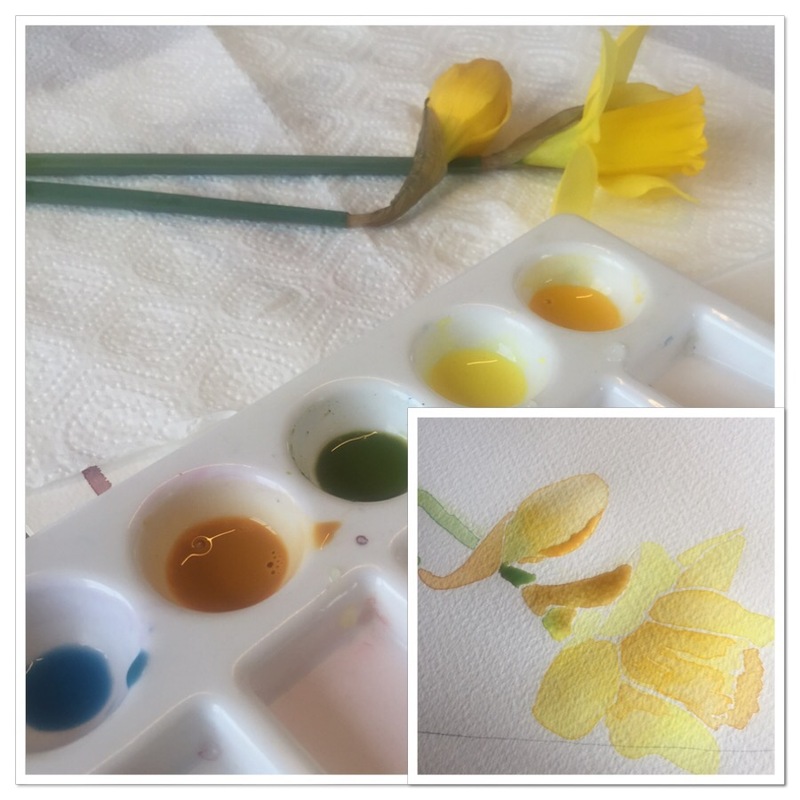 Lovely watercolour daffs – I’d love to be able to paint but I suppose I have enough hobbies to keep me busy, better not add any more to the mix. 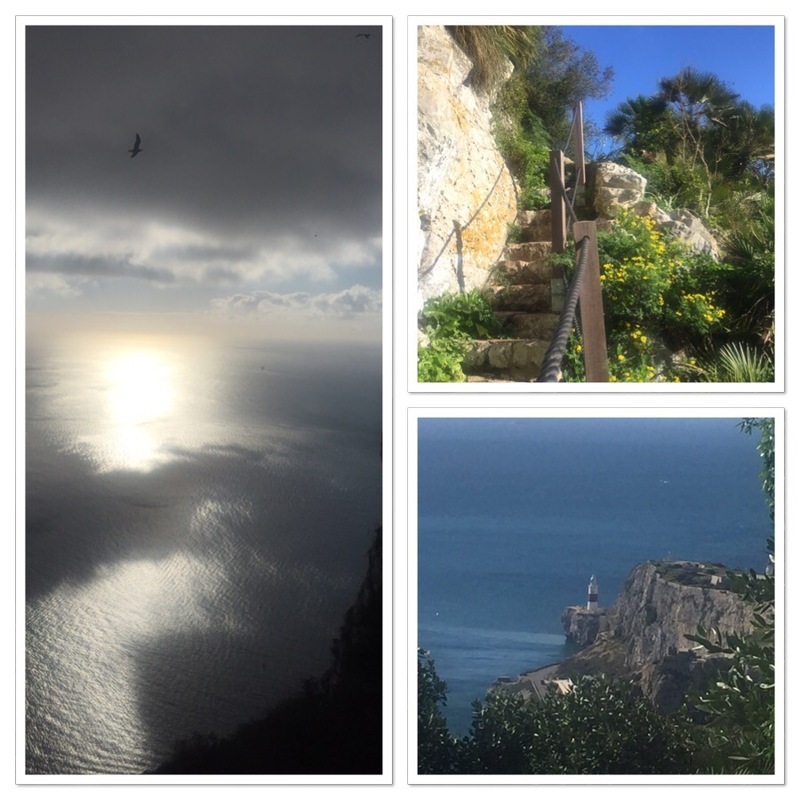 As for climbing the med steps – they look lovely and steep so bon courage! When is the challenge? It truly is marvelous stuff that lemon curd! I haven’t tried it on porridge just got on bread (and rich tea biscuits – yum!) or as a cake filling I’ll give it a go – I’m a big porridge fan! The skirt wasn’t cut on the bias, I just had a big square of fabric which was folded in half under the watchful eye of my tutor and we literally cut a full-circle from it. And then sliced up one side in order to make way for the back seam and zip. I’ll keep you posted on my progress. The Med Steps challenge is in May so I have two and a bit months to get up to speed, if I don’t keel over before then that is! You are so talented all that creativity! As for the lemon curd, homemade is glorious. But home grown and home made must be out of this world. Thank you Cathy, but I do feel like I’m a Jill of all trades and mistress of none at the moment! I think I haves it much on to be honest. I need to learn to stop saying yes to so many things – I can’t resist it if I’m given an opportunity to do something new! All that creativity and energy is making me feel quite inadequate! However at your age I was the same, lots of interests and activities although I didn’t have a large family to take care of. But I did have my own business to run plus a part time job and a daughter! As the years pass my interests have reduced and changed. Took your earlier advice and brought my sewing machine out of hibernation and I too am making a skirt but not a circular one. I’m shorter than you and would look like the Michelin man! Have unpicked a skirt which I had made in China for me years ago and which I have worn and worn until it practically fell to pieces and will be using that as my pattern. But first of all I have to find a surface to lay out the material – my dining table is covered in art materials! P.S. I LOVE lemon curd and would happily buy a jar if you have one to spare. Glad to hear you are having a go with your sewing machine. You shouldn’t feel inadequate – I have never worked since going on maternity the first time and I just can’t comprehend how you work & be a mum at the same time – it’s completely alien to me,so there’s my inadequacy! Sorry I couldn’t reply to your last message re the car. Is it fixed ok now? We missed you at watercolour class. I wouldn’t call bringing up three children inadequacy! Anyway we all manage in our different ways and for different reasons. Car is back in garage on Wednesday – it’s a long story! Someone has just given me some gorgeous lemons so am going to look up a recipe and have a shot at it myself! If you need any art supplies send me a pm on Facebook. Hope to go to Jacksons shop in Fulham. See you in a couple of weeks, meanwhile “Keep creating”! Lovely photos. That circle skirt looks like it will be fantastic. I do like circle skirts but they can really be fabric hogs…. Thanks, yes a lot of fabric went into making it but I do love it! 🙂 this one will definitely be worn! I really like them I just never seem to have many opportunities to wear something that voluminous. Fortunately this fabric’s very thin so perfect for a Gibraltar Summer’s day. Roll on summer! It’s such a privilege to know we’ll actually get one!